After flying our bikes half way around the world, sacrificing poor bambi along the way, it was well past time to clock up a few kilometres on them. It was a rather auspicious start: Yes - I'm allowed to tell you that Ange fell off at the gate. I thought she was just behind me and got to the top of the hill before I realised I didn't have a tail. Anyway, I do believe that it was my fault, after reassembling the bikes I had set her seat too high. After today I'm sure that these bikes of ours will more than pay for the cost of getting them over here. 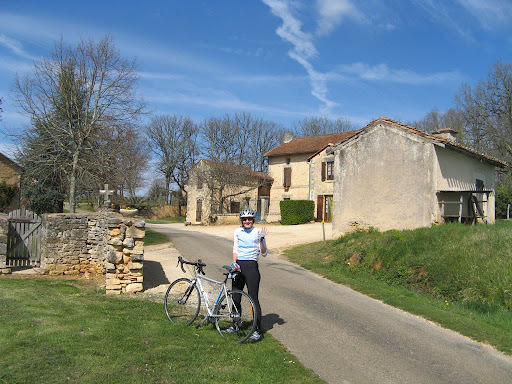 I'm so looking forward to exploring the myriad of back roads that crisscross the Dordogne.